If there’s anything that has been going up faster in Pittsburgh these days than apartments, it’s hotel rooms. Developers can’t seem to help themselves. By the Pittsburgh Downtown Partnership’s count, there are 4,952 rooms in the Golden Triangle, the North Shore, the lower Hill District, the South Side and the Strip District, with more than 1,000 of those opening in the past seven years. Another 1,709 are in the pipeline. With all of those rooms, you would think we were a tourist destination. Here are some new hotels to give you sweet dreams in 2016. What does East Liberty have in common with such urbane destinations as Seattle, New York, London, and Palm Springs? 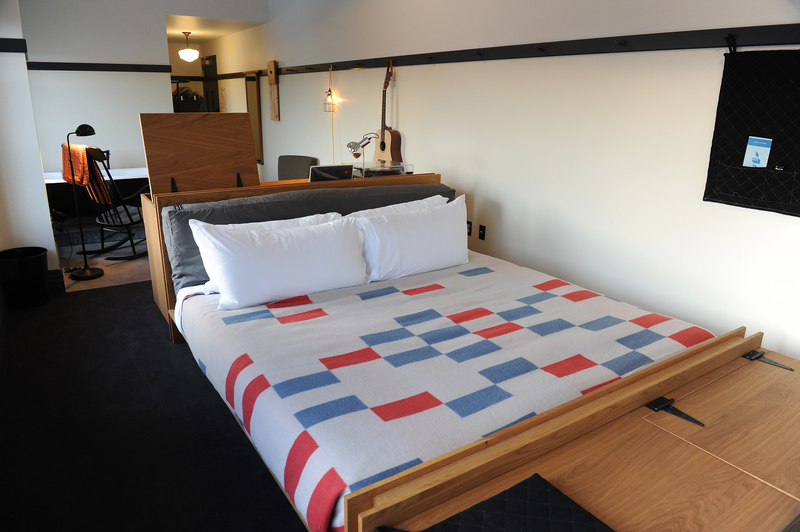 An Ace Hotel. This ultra-selective chain has settled into a century-old former YMCA at 120 S. Whitfield Street with 63 rooms, a restored grand ballroom with floor-to-ceiling windows, and a whole lot of hip. It has converted the Y’s three-story gym with a track into a space that can be used “for performances, video and experimental works, as well as casual competition.” There are basketball hoops and high-definition projection screens. In keeping with its quirky image, the hotel, which opened in December, plans to show sporting events beneath a preserved mural. It also is using some of the building’s original glass in the vestibule. Ace is said to be the preferred hangout of hipsters and Googlers, whose Pittsburgh headquarters is a stone’s throw away. Topping it all off is Whitfield, a 100-seat restaurant where breakfast is served all day. If you fancy yourself as the suave James Bond type or a hard-bargaining international financier, this hotel may be just the ticket. Drury Inn and Suites is converting Pittsburgh’s former Federal Reserve Bank at 715 Grant St. into a 200-room hotel. The building that once featured gun turrets, a firing range and bank vaults big enough to park a semi will give way to a rooftop swimming pool and other amenities. Drury plans to use the four lower-level bank vaults — one 38 feet by 60 feet with a 30-inch-thick steel door — for meeting rooms and parking. The hotel is expected to open this winter. The Embassy Suites Hotel at 535 Smithfield St., Downtown, gives new meaning to the term “above-ground pool.” Its indoor pool is 25 stories up. As an added bonus, Ollie’s Gastropub, a bar on the same top floor, looks directly into PNC Park. There’s also a second-floor ballroom and a conference facility. The hotel, which occupies floors 15 to 25 of the Henry W. Oliver Building, a 105-year-old architectural landmark designed by Daniel Burnham, offers 225 rooms, nearly all of them suites. It’s the only all-suites hotel Downtown. If you like American comfort food such as fried chicken or lobster rolls, Elevation, the hotel’s 25th-floor restaurant, may be the place for you. The owners have sought to give this hotel right off Market Square at 250 Forbes Ave. an upscale boutique-like feel. Rooms have hardwood-like vinyl on the floors and big windows to bring in lots of natural light. Expect employees to greet you in the lobby and walk you to the front desk rather than wait for you there. To open in February, the hotel, with 197 rooms, including 11 suites, has two restaurants. Revel at street level is more casual and doubles as a nightclub on weekends. Roost upstairs features upscale dining with private rooms. Guests also get full and free access to the indoor pool, equipment, and classes at the YMCA across the street. Now there’s a new hotel in the Strip District to collapse into after a hardy day of shopping, eating and drinking in the neighborhood. Homewood Suites by Hilton Pittsburgh Downtown at 1410 Smallman St. features 150 studio, one- and two-bedroom suites with fully equipped kitchens. Breakfast and Wi-Fi are free. Other amenities include an indoor pool, fitness center and an outdoor deck with fire pits and grills to cook all that fish you bought earlier in the day. And if you’re too tired to grill out, there’s always Lidia’s restaurant next door. The hotel, which opened in November, also is a short walk from the David L. Lawrence Convention Center.